... you design Pedagogical Gameplays for a Serious Game. How to make learn high-level knowledge including understanding different points of view? Make users play different roles and interact together. 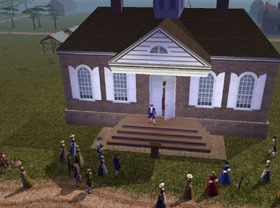 For example, in Revolution, students choose roles (a slave, a carpenter, a patriot...) and live a common multi-player story taking place during the American revolution (see picture). The goal is to make them learn by collaborating, debating or competing in the game.